I manage 10 gites including the last "Les Roches Grises" which opened at the end of November 2017. Located 3h30 from Paris by car and also accessible by direct train line. 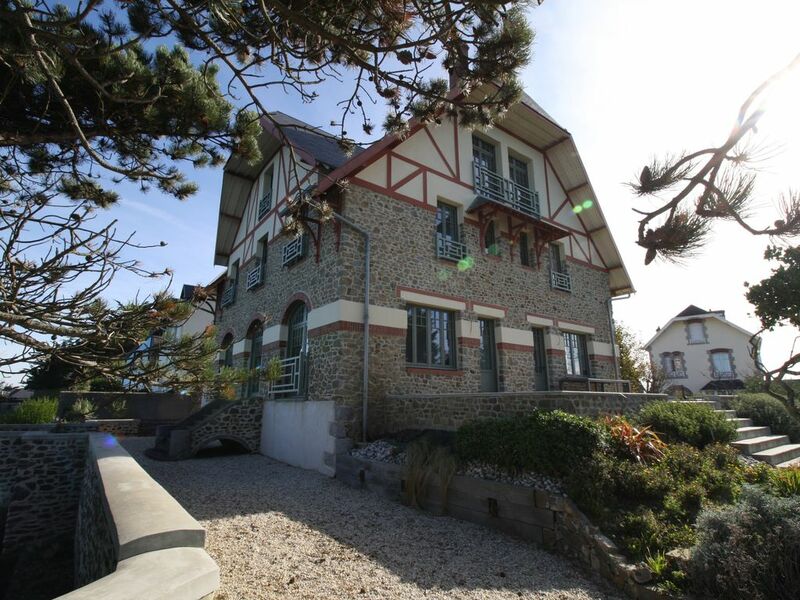 Located 500m from the city center, next to the Dior museum, its location is exceptional: 100m from the beach with private access by stairs, panoramic garden facing the sea more than 180 ° with the Chausey Islands, the upper town and the Côte d 'emerald... This house is breathtaking. Completely renovated in 2014 with high quality materials. Located on a rocky promontory, Granville is a very beautiful seaside resort nicknamed the "Monaco of the North"
With the presence of a casino and several large luxury hotels, Granville has always attracted artists. This ancient corsair city and defense fortress of Mont Saint-Michel, is also equipped with a golf course and a racecourse, tennis club 2 min walk and sea pool in front of the Villa. You can do everything on foot because the city center is just 3 minutes walk from the villa. This one is very alive with these shops opened on Sunday and the market and junk shops on Saturday morning and Sunday. The refined decoration in tune with the times will delight you to make your weekend an unforgettable stay. While the most athletic have gone running on the beach. In case of bad weather, they can always retreat to the gym located in a part of the garage with ping pong table, bike, tilting plate and elliptical trainer. This room adjoins the small movie theater for 8 people with large flat screen and DVD access Netflix. The day has gone so fast, too fast it is already 18h on the ground floor, the grand piano Yamaha lets emit a divine sound. The music lovers savor this moment of happiness by the fire facing the sunset while the others are lazing in the SPA for 6 people with a glass of champagne in hand. The youngest after having spent the afternoon on the beach, still play ball in the garden of 1500m2 fully enclosed. The girls are on the other hand in their playroom on the last floor. It is 8 pm, the electric gate opens, guests are expected the chef at home has been working for a few hours in the kitchen around the beautiful piano Falcon and three refrigerators. Everything is ready to welcome the guests the beautiful table for 15 people is erected. At night the facade and the garden are illuminated. The baby sitter has just arrived, and the professional pianist who animated the late evening has just left, the parents will be able to go have fun at the Casino and dance all night! It is 06h the night was magic the sun is pointing the tip of his nose. The night owls get longer on the meridians of the rooms on the top floor to admire the show. Another beautiful day begins because today the family has planned to take the boat to visit the Chausey Islands in front of the house and tomorrow it will be Mont St Michel, after tomorrow St Malo Dinard and Cancale, and for the end of stay: the Champrépus Zoo and the landing beaches. A small anthology of the many tourist and historical attractions that are not lacking in Granville and the region. Living at the water's edge is priceless, the show never stops! We could have spent hours just watching the tides just outside the windows. But there was so much to do: a short drive to the D-Day beaches, to Le Mont Saint Michel, and to Cancale, and a short walk to delightful restaurants and bounteous fresh seafood! Les Roches Grises is a beautiful home, is very family friendly, and offers everything you might need in order to make a lifetime of memories! Les Roches grises est le lieu parfait, excellemment situé avec une vue magnifique, très spacieux, très bien équipé...la cuisine donne envie de préparer les repas. 8 chambres très joliment décorées, et 5 salles de bain qui annulent l'attente du réveil sous la douche. Un espace détente au sous sol qui ravira tout le monde avec billard, baby foot, table de tennis de table et espace TV. Et enfin Jennifer est de très bonne écoute et de très bon conseil, nos échanges ont fortement participé à notre choix pour cette villa, sachant que les autres sites ont l'air d'être à l'instar des Roches grises de très haut standing. Merci pour tout et peut être à bientôt avec plaisir. Un grand merci pour votre commentaire, votre sympathie et votre venue pour votre séminaire. Un grand merci a vous il est vrai que cette villa est vraiment merveilleuse ! J'ai beaucoup de chance d'avoir pu la décorer et l'aménager afin de la proposer a mes clients! Vous avez eu raison de la réserver car mon bail s'arrête fin septembre. super anniversaire en petit commité dans cette luxueuse villa . Tout était à disposition pour distraire chacun de nos hôtes. Magnifique vue de la mer de chaque chambre et surtout de la salle à manger. Le portail s’ouvre et nous découvrons cette grande demeure. Nous ouvrons la porte de la villa et nous en prenons plein les yeux, tant par la vue de la mer que par sa décoration. Nous visitons et cela va de surprises en surprises, un espace jeux : billard, babyfoot, salle de cinéma, de jolies salles de bain, chambres magnifiques, décoration de très bons goûts, et un spa idéalement placer. Tout est là pour passer de très bons moments en famille ou amis. Le centre ville est à 5mn à pieds et offre de belles ballades, et de très bons restaurants. Jennifer est là pour nous guider dans les différentes activités proposées et nous proposer des professionnels ciblés à nos recherches.